The Fellowship was fortunate enough to obtain a copy of PROTECTORS,INC. #1 from Image Comics. J. Michael Straczynski writes, Gordon Purcell draws and Michael Atiyeh colors. 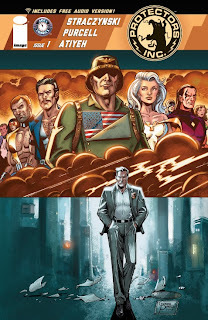 Protectors, Inc. is a loose collective of nearly all of the “superheroes” in the world. There aren’t that many, and they’re all good guys, so mostly all they do is handle petty crimes and work their territories. They clash occasionally, but it’s pretty civil overall, if loud. But then a young woman disappears, and there’s trouble on the horizon. This issue contains a whole lot of backstory, giving us the nutshell history of supers in this world. Where they came from, how they operate, their social patterns and tendencies. And it’s all really well done; the details give it a sense of realism that’s every reader’s dream (whether they know it or not). JMS even leaves a little room at the end for a simple teaser into the arc, which is a nice touch. Overall this is a nice beginning to this newest offering from Joe’s Comics. It’s a good setup, and there’s just enough hint that’s something’s brewing to make it interesting. I’m looking forward to seeing more. 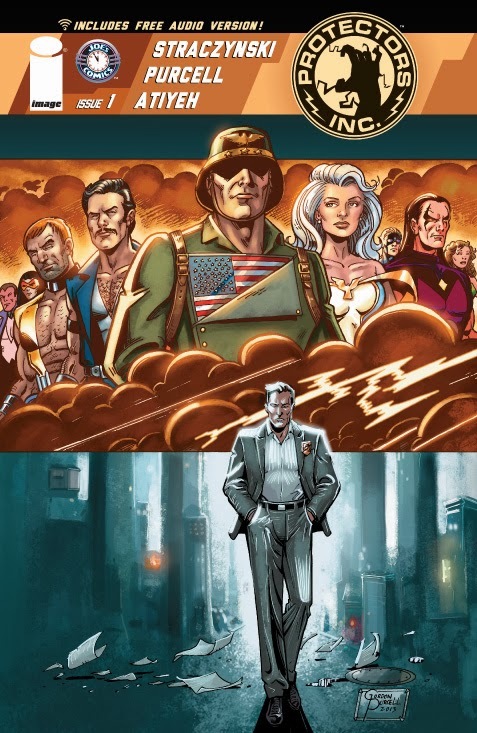 PROTECTORS, INC. #1 is available now at your FLCS and online at imagecomics.com.